Raw success is easy when you know the fundamentals. Chris at 54. Still raw. Still training only an hour a week. Even less. Details coming soon. It has been a long time since I posted a video. Or picture. This website is only the beginning. I built it fast and furious several years ago when I first got excited about raw, after eating a plant based diet, including refined grains since 1985. But then a food expert and scientist called me and hinted that I should go raw. After sharing this with my girlfriend, within days there was appeared box of books at my doorstep. We devoured them quickly. As a personal trainer specializing in efficient fitness & food results, I knew that my mission had taken a turn. In no way did I want to go raw. I did not care for the typical vegan or vegetarian "follower" as we had both gone to meetings and seminars for years and discovered that most people are not really serious. They just like to talk. And meet people at these meetings and seminars. Many years later I started my own classes and seminars. I attracted serious people, many of which remain clients or good friends. But I have been lax. I have had to work 14 hour days as my self-taught gourmet raw transition food and nutrition plan took wings. I had to open a second location to make the food. There was hardly enough time to do seminars let alone continue my already established personal training center. But I hated rabbit food or even a diet of just salads. So I just had to figure out how to make raw food taste as good as or better than the best cooked foods that I grew up with, but that were starting to take their toll on my health. I would not even have known how damaging and limiting to fitness progress they were had I not tested raw out by eating raw once per week. I never thought I could stand it. But I felt so well that I tried twice then three times per week. The rest is history. But as i said, I had become engulfed in long exhausting work days managing two brick mortar locations and a new developing client base. I would not have survived on the typical diet. (Sure, most people lose their health while in search of wealth, but I soon learned that it was not worth it. Of course it took many years for it to get through my thick head). Several years of this caused me to get skinnier and skinnier. I would have surges of muscle mass gain when the workload was less. Long story short, I gave up the second location and focused on education not gourmet raw consumption. PS: I have had grey hair since I was 37 years old. About twelve years later I dated a girl who suggested I darken it. So we did. So the grey hair happened before I went raw. I really did not care about the color. But now a lot of the pictures on this site show me with dark hair. I'll put up new pictures anyway when I get more time. Chris shown here after just a few years of raw. 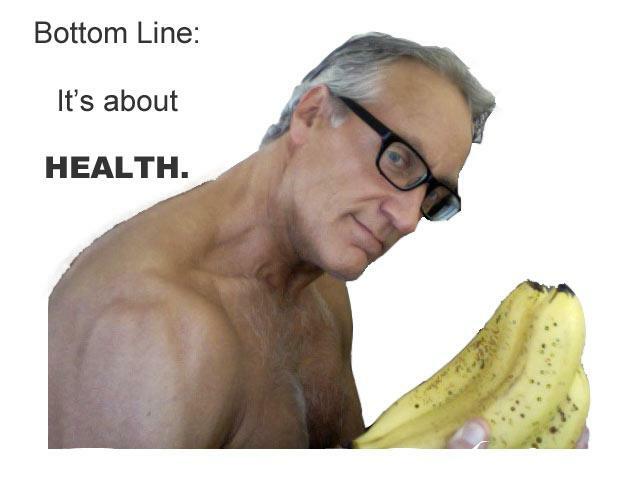 He's been following and teaching fundamentals of nutrition for 35 years. 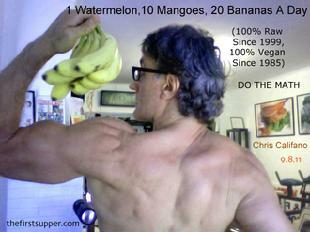 Click image to email Chris directly and then watch The Best Weigh Blog for answers to the best questions. when others got less than stellar results? He practiced the fundamentals of the best nutrition before he upgraded to raw in 1999. Even before he upgraded to vegan in 1985. Born un-breast-fed, bred on the standard American diet, and growing up a skinny nerd with poor leverages and fair digestion and forever suffering from sinus infections and "allergies" not to mention being made fun of by his young classmates who had vastly superior genetics and athletic prowess, Chris decided to combine Rest, Food and Exercise (The cornerstones of all health and fitness) and coined the phrase "The Magic Triangle" as part of his Best Weigh Longevity Center in 1985, where he designed fitness programs, healthy diets, designed home and corporate gyms, as well as trained individuals and groups from banks, schools, athletes, and celebrities. As far back as 1974 Chris learned that rest, food and exercise, when performed PROPERLY were paramount to transforming his weak, sickly frame and internal health into what he considered "at least normal". Compared to where he started, most would say that he made a profound change, even unrecognizable. "Through years of trial and error (plus allowing the cleansing and detoxification process to take its course first and foremost), I have found that my present "fruitarian" diet, which consists of raw fresh whole fruits (95% by calorie-nutrient volume) and dark greens, tender greens, and some vegetables (1% by calorie-nutrient volume), and some nuts, seeds or avocado, is by far the best for building muscle & strength." "Since I have been training with weights since age 15 1/2 in an attempt to transform my skinny, ectomorphic, long-limbed, weak-jointed and sub-normal health and physique, I discovered many things that can be helpful to others. To be brief, my vain attempts to gain weight and strength even when eating animal protein and cooked food soon improved when I learned and applied the fundamentals of nutrition. (I am perplexed to this day at the number of men and women who are not getting results who simply do not know or apply these basic diet fundamentals. That is only the first step! But the most important one!)." "Almost everyone makes good progress at the start of a program (the ones who do not simply do not apply basic food and fitness fundamentals)." "After many years of "disciplined' eating and exercising I noticed severe lack of health. Little did I know that the "occasional" congestion, sore or dry throat, mild headaches, fatigue, body odor (most would consider "normal" and just fall for that), and all the other "normal health problems" that everyone takes pills and remedies for, and/or accepts as "part of normal everyday life", I decided to become vegan. Many of these ills went away." 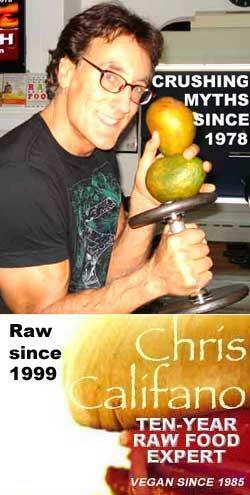 "The move to raw was a difficult one for me, since I did not want to change the way I ate. After all it gave me pleasure and I thought I was "eating healthy' and I was building muscle, which is the "acid test" for health (the ability of a body to make tissue without any drugs or steroids is the best test for wellness that there is)." "Going 100% raw produced health and healing results that were beyond what I even imagined could happen to a human body. I will detail these many and exact SIGNIFICANT improvements to every single inch of my life soon. Suffice it to say that you do not know what life feels like until you eat truly properly- which means to virtually eliminate every bit of improper "so-called food" that our society has convinced us to eat as "sustainable". Since I guess I am blessed to realize that it is my duty to strive to be my best, even against my own ego and habits, I decided to take the plunge and "go raw" against all odds around me. Who the heck wants to go raw. It does sound preposterous when all those around you all seem to speak with such authority as they gulp down their "processed and civilized food" LOL!" "So it happened. I had already been established as a brick and mortar wellness and fitness center, so I felt that it was my "duty" to do this. After all, what doctor, nutritionist or behavior specialist, etc would not want to actually help people get healthy? Well I discovered in my humble 33 years of doing this professionally, and training and giving lectures and classes to many natural doctors, medical doctors, nutritionists, and psychologists and trists, that few of them were even aware of what health felt like. So how could they teach it or instill it in others? That is what my "who are you- are you a doctor!" brain was telling me..."
"In a nutshell, the secret was to make the food taste so good that I would eat it. Hey- I am like you- I am just a food whore. Face it. We all want food to be easy on our pleasure centers. We are all addicted to food. So I learned to become an ultra gourmet raw chef. I say ultra since my goal was to convince others to do this. The only way was to get them to eat it for a week. Well I set up consults at my office and kitchen and wellness/ fitness center. Guess what? I even had to rent a second location a mile away it was so successful. They not only loved the food they could not believe it. Most people tell me to this day that even if they took just one class, that it changed their lives forever. To be continued..."
I never would have believed it myself.